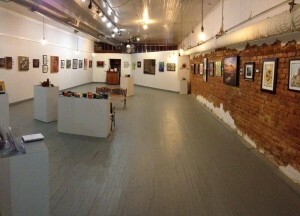 Being in the midst of Concord’s historical community, Sundae Art Gallery is geared towards its neighbors’ interests. The gallery offers work from over a dozen local fine artists amongst the joy of the artisan ice cream served below the space. Additionally Sundae Art Gallery envelops the interests of individuals or groups looking to learn more about the creation process by offering artistic educational opportunities and events for all ages. They offer several different painting classes as well. When: Tue., Sept.15, 6:30pm – 9:00 p.m.
Webtoon provider RollingStory has announced that the episodes of their webtoons finally debut on the Huffington Post this month, offering fresh and free content to readers. By publishing to the Huffington Post, Spottoon is preparing to change the online comics industry with new, unique experiences for the readers, providing refreshing alternatives to the same stale superheroes of big comics companies that have dominated the industry for years. ClearWater Artists Studios will be holding their Second Saturday series with OPEN STUDIOS! Description: Artists on-site working in Studios; open to the Public for exploration, watch art being created! ‘Manned’ by artist members with doors open 10:00 a.m. to 4:00 p.m. Facility Phone: 704-784-9535 Free to attend and Free Parking on site! SAVE THE DATE For Saturday, Sept 12, we kick off with the official GRAND OPENING of 2nd Saturday Open Studios at ClearWater! The day will feature original-designed, locally fabricated ‘BIG’ easels with three artists working large-format works in progress, in the Gallery; the unveiling/ dedication of Robert Crum’s floor mosaic in the Gallery; and a special new exhibit of ClearWater artists’ works on a water-related theme, among other attractions (including the Southern Piedmont Woodturners). Kannapolis Arts is organizing a tour with the North Carolina Music Hall Of Fame at 2 p.m. Saturday, August 29, to give our volunteers and supporters a chance to explore the hall of fame on a weekend. This great venue in Kannapolis featuring items from Ben Folds, Tori Amos and others. This will be a free event, but we are asking visitors to make a donation to the North Carolina Music Hall of Fame. They are a small organization with limited funding and this tour is meant to explore the venue as well as help support the hall of fame. Visit our event invite on Facebook to sign up! The Kannapolis based Circus Stella is looking for support for their Kickstarter campaign to make a workout video. Dextre Tripp and Jana Colgin form the husband and wife owners of Circus Stella with their five trained dogs. This Friday, during the Concord Art Walk, step into the Cabarrus Art Guild to see a collection of work from local artists.